Backed by an investment from Vista Equity Partners, Austin, Texas-based YouEarnedIt acquired fledgling semi-competitor HighGround. In announcing the deal, the companies emphasized the addition of HighGround’s performance management focus to YouEarnedIt’s reputation in employee experience technology. Founded in 2013, YouEarnedIt was built on the idea the improved employee experience would positively impact business results. 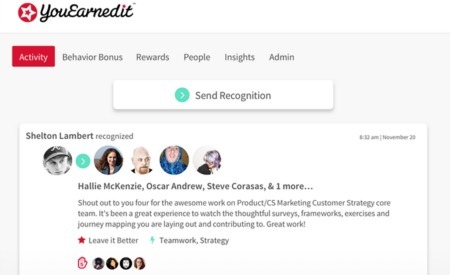 Although the companies will continue to operate independently, HighGround’s platform allows YouEarnedIt to offer SMB and enterprise customers with a wider variety of social recognition, rewards, employee-feedback and performance management tools. HighGround, which is headquartered in Chicago and employs about 80 people, was started in 2012. It’s not yet clear whether at some point the platforms will be integrated. However, YouEarnedIt, which has about 90 employees, said that HighGround’s position in the performance management space, merged with innovations from both companies in real-time rewards and recognition, “will provide a distinct competitive advantage for YouEarnedIt and HighGround customers.” Together, the companies expect to benefit from expanded resources and accelerate their product roadmap. Financial terms weren’t disclosed. According to the Austin American-Statesman, Manning will serve as CEO of the combined companies while Harris takes on the president’s role. HighGround’s solution works in real time to leverage employee-driven goals, continuous check-in conversations, peer-to-peer feedback, social recognition and pulse surveys. In addition to improved engagement, the company says it also provides an organization’s leaders with data that can help guide their workforce investments. Having made more than $31 billion in capital commitments, Vista Equity Partners invests in software, data and technology-enabled organizations with what it calls a long-term perspective.